The Greater Phoenix area, nicknamed the “Valley of the Sun,” is a gorgeous metro area that enjoys more sunshine than any other in the United States. The fabulous weather alone is enough to draw people from far and wide to make the area their new home. However, fantastic weather and seemingly endless sunshine are just the beginning of what this extraordinary city has to offer. Phoenix, Arizona, the state’s capital, boasts a surprisingly low cost of living, a vibrant job market, an abundance of breathtaking natural beauty, a multitude of recreation opportunities, and countless other remarkable amenities and features. In fact, if you want to get a taste of what Arizona has to offer, Phoenix is the place to start. On top of all we’ve mentioned thus far, Phoenix also has a quintessential downtown complete with ultramodern office buildings, exceptional dining opportunities, and chic shopping districts. Adding to the appeal of this esteemed city is its rich history and its progressive nature. You can celebrate the past at the Pueblo Grande Museum & Archaeological Park and then revel in the excitement of things to come at the Arizona Science Center. Or if you want to escape it all and simply bask in the natural beauty of the area, Phoenix offers over 2,000 square miles of gorgeous desert, stretching to the mountains, and crisscrossed by biking, hiking, and equestrian trails. For all the reasons, among many others, Phoenix has been ranked 44th out of the 100 best places in which to live in the U.S.
With all these distinguishing features and advantages, it is no surprise so many choose to call Phoenix home. Prospective homebuyers considering relocating here will be pleased to discover Phoenix is a buyer’s market. 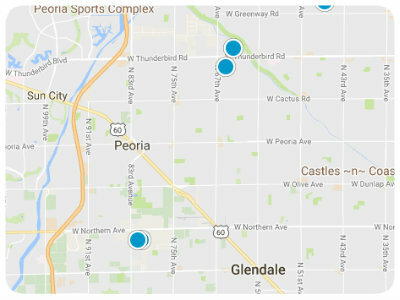 Homes for sale in Phoenix include properties of all shapes and sizes, most with listing prices below the national median. Whether you are looking for an urban lifestyle in the city’s revitalized downtown area, or you seek something with a bit more privacy and elegance, you can find it here. There are condos, townhomes, lakefront homes and expansive estates for sale in Phoenix. Phoenix has gated communities, golf communities, active adult communities and luxury home communities from which you may choose. Truly, anything your heart desires can be found in the Valley of the Sun. If you would like to learn more about the homes for sale in Phoenix, Arizona, please allow us to assist you and contact us today.